Webguru Infosystems offers end to end eLearning solutions for the educational institutions and corporates. As a premier website development company, we help you facilitate the learning and training of students or trainees through a dynamic, engaging and easy to use eLearning software suite. Our comprehensive eLearning management system helps you to host, upload, monitor, assess, and administer computer based learning. 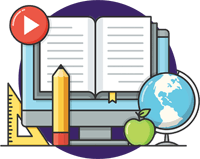 As a leading eLearning solutions provider, we provide you with a powerful yet simple learning/training interface for the students and trainees – both in offline and online mode. The students or trainees can enrol into any of the courses/batches as per their convenience and make payments. On the other hand, you can make use of the portal’s bulk enrolment facility and admit students in large numbers for specific courses/batches. The state of the art eLearning management tool provides you with the facility of uploading course materials in the form of engaging videos and PDFs pertaining to any subject or training module. The course materials can be easily managed at your end through additions, deletions, or modifications. A student or trainee can visit the relevant section(s) of the eLearning portal and access course materials for which he or she has enrolled. The eLearning website allows you to set up the class schedule for various courses or training programmes. For online classes, the students or trainees can visit the relevant section of the eLearning solutions portal and find out details of the classes. The portal gives users the facility of accessing the video recordings of all courses/training programs irrespective of the day/week/month/year. Evaluation forms an important part of any training or learning programme and offers an insight into the level of understanding of the students/trainees. As one of the prominent eLearning website features, the assessment module completes the cycle of learning. You can upload and manage the assessments for any course/subject/training program in both MCQ and subjective formats. The assessments in the MCQ format deliver results immediately. The module comprises features such as data validation, number of attempts, timer, report generation and skip ability. It allows you to create question banks and upload bulk questions as well. Our innovative and comprehensive eLearning services let the students/trainees get their queries resolved by contacting the subject matter experts within timelines. This feature makes the eLearning management system interactive and user friendly. The modus operandi is simple – students or trainers log their queries on the specified section while the subject matter experts analyze the same and post responses in a swift and timebound manner. Each organization has its own scholastic or business goals. Our visually attractive, engaging, and highly interactive eLearning website design lets you create your eLearning strategy, curriculum, or storyboards for any course, subject or training programme. We create and host the eLearning solutions website exclusively for your organization, one that reflects its look, feel and essence. In a day and age where mobiles play an important role in disseminating information or provisioning services, the features of our eLearning solutions website can be easily accessed from a mobile platform. This helps the tech savvy students or trainees to keep in touch with the learning or training programmes on the go. Each and every segment of the eLearning portal is capable of generating a comprehensive report to help you study and analyze the performance level of students/trainees, list of courses, number of students enrolled etc. The reports provide an insight into the progress of students/trainees undergoing various courses or training programmes as part of the eLearning management system. To facilitate the learning or training of students/trainees and expand your business, avail our feature-rich, highly interactive, and ready to use eLearning solution. We also customize the eLearning solution according to the theme and needs of your business.